Stop! Go! 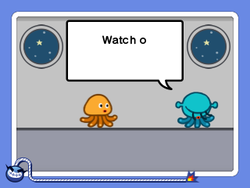 is one of Dribble & Spitz's microgames in WarioWare: D.I.Y. Showcase and WarioWare Gold. There are two aliens, an orange one and a blue one. 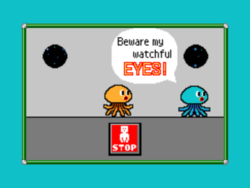 The player must tap the "Stop" button to stop the orange alien and the "Go" button to make it walk. If the blue one sees the orange alien walking, soon after saying "Beware my watchful EYES! ", the player loses. If the aliens touch each other, the player wins. However, the player must do it before the time runs out. In WarioWare Gold, the player controls the orange alien with the rather than an on-screen switch. The blue alien's line is "Watch out for my EYES!" 1st level difficulty: The blue alien speaks slowly. 2nd level difficulty: The blue alien speaks faster. 3rd level difficulty: The blue alien speaks at random speeds, including faster than the previous stages. He will also occasionally say "eye holes" instead of "eyes." Spanish (NOA) ¡Hazte estatua! Make yourself a statue! French (NOE) 1, 2, 3... Soleil! 1, 2, 3... Sun! Italian 1, 2, 3... Stella! 1, 2, 3... Star! This page was last edited on March 11, 2019, at 17:28.